Par West offers the finest in men's bespoke custom golf shoes. Each pair is hand crafted to your individual measurements and specific design choices in 8 classic styles. The process begins with a fitting kit that each customer completes and returns to have their custom "lasts" created. Then choose the style and leathers from a wide selection of fine calfskin, American bison or other exotic leathers from around the world. Delivery of the first pair usually takes 8-10 weeks. 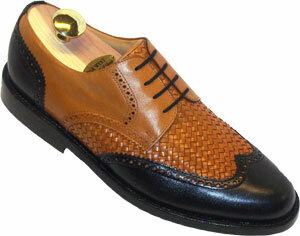 We also offer custom men's dress shoes. Your satisfaction is unconditionally guaranteed! © 2011 ParWest Custom Shoes. All rights reserved.